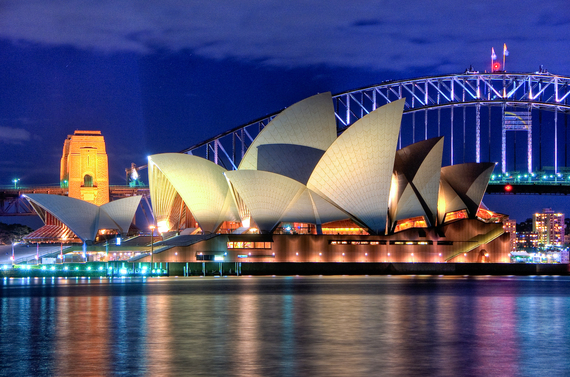 Australia has always been a mecca for all travelers - business, and leisure. Its natural beauty includes lush rainforests in the north, the remarkable Outback, and the Great Barrier Reef. I interviewed Australian Travel Specialist Alicia Saba of Departure Lounge for her advice before planning your trip to Australia to maximize your experience. Australia is the 6th largest country in the world and spans multiple climactic zones. Since it's in the Southern Hemisphere, the seasons are reversed from countries in the Northern Hemisphere, such as Canada, Mexico, and the U. S. Alicia informs, "Rainfall differs dramatically from the tropical north to the temperate south, while temperatures at one end of the country are often very different from the other." In the red center of Australia, the temperature can fluctuate 80°F in one day, so pack for all conditions if you're visiting Uluru (Ayers Rock). The area surrounding the Great Barrier Reef experiences two distinct seasons, the wet season and dry season. The summers are hot and humid and the winters are dry and warm. In Tasmania, the island off the coast of Australia, the winters can get quite chilly. "Although Australia is notorious for its dangerous wildlife, that danger is embellished," says Alicia. "It's true some of the more venomous creatures on earth can be found both inland and on the coast." Alicia encourages travelers to avoid driving at night, in outlying areas, to avoid hitting kangaroos, wallabies, and other wildlife. 'Stinger Season' is in the summer in Queensland when jellyfish can be seen on the beaches. During this time, it is necessary to wear a stinger suit or only swim in beaches with stinger nets. Alicia advises, "If you plan on frequent swimming or surfing, buy a suit at a local store on your first day rather than renting numerous times. Always obey the wildlife warning signs." A frequent traveler, Alicia advises, "Australia has one of the strictest bio-security regulations in the world regarding the transport of biological entities." These include food, plant material, and animal products - items we like to bring as gifts such as chocolate, fruits, and jams. Failure to declare them can lead to a hefty fine. Alicia informed me "Australia has been threatened by invasive species before, such as the cane toad, which has become a serious threat to crops and food production. If unsure, always declare it at customs - or leave it at home." Bring non-food gifts made in your home country like books, golf balls, luxury soap, tea towels, or bookmarks. United States citizens must apply for an Electronic Travel Authority (ETA), which provides authorization to enter Australia and is electronically linked to your passport. The ETA grants permission to visit Australia unlimited times in a 12 month period for up to three months at a time. There is an AUD20 service fee. Before purchasing your airfare, secure your ETA by applying here: https://www.eta.immi.gov.au. "One thing that always takes visitors off guard, especially on their first trip to Australia, is the unique Aussie slang and the speed that the Aussies speak," says Alicia. A few key common phrases to keep in mind include: Thongs (flip-flops), Sunnies (sunglasses), Cuppa (A hot beverage), Good on ya (Great job), Heaps (A lot), Bottle-O (liquor store), and Mozzie (mosquito). In restaurants, what are listed as "Appetizers" in the U.S. are "Entrées" in Australia, and "Entrées" are listed as "Mains." Alicia cautions that, "another important factor to consider, especially for travelers coming from more temperate regions, is the sun. A fact that surprises many visitors: there are several holes in the ozone layer above Australia. The UV index can routinely reach dangerous levels." Always carry sunscreen with an SPF rating of 60 or above, and do your best to stay out of direct sunlight, especially mid-day. Know your body limitations and drink enough fluids. If you feel dizzy or lightheaded, find shade immediately and rehydrate. Tipping in Australia is a controversial topic. Some Australians suggest tipping and others advise to never tip under any circumstances. If you tip at a restaurant, 10 percent is sufficient and only to reward good service. At restaurants, the bill is settled in the front of the restaurant, unlike the in U.S. where the bill is brought to the table. So when finished dining, arise, and pay at the front. Tour guides do not expect a tip, but a few dollars is always appreciated. Alicia Saba has spent extensive time traveling Australia and is passionate about helping others get the most out of their travels, making them easy, comfortable, creative, and smooth. To find out more and to get started planning your upcoming travels visit aliciasaba.com.